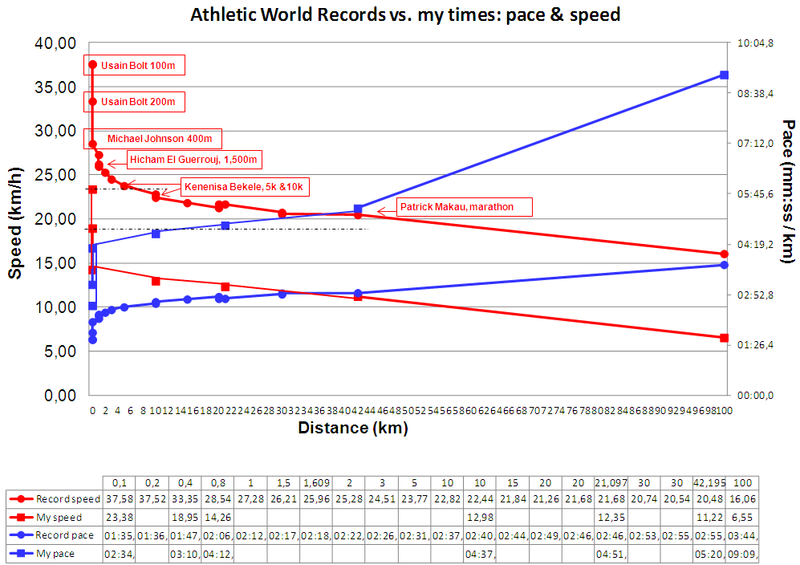 Two weeks ago I published a post where I showed a graphic of the different world records in athletics with the speeds and paces. 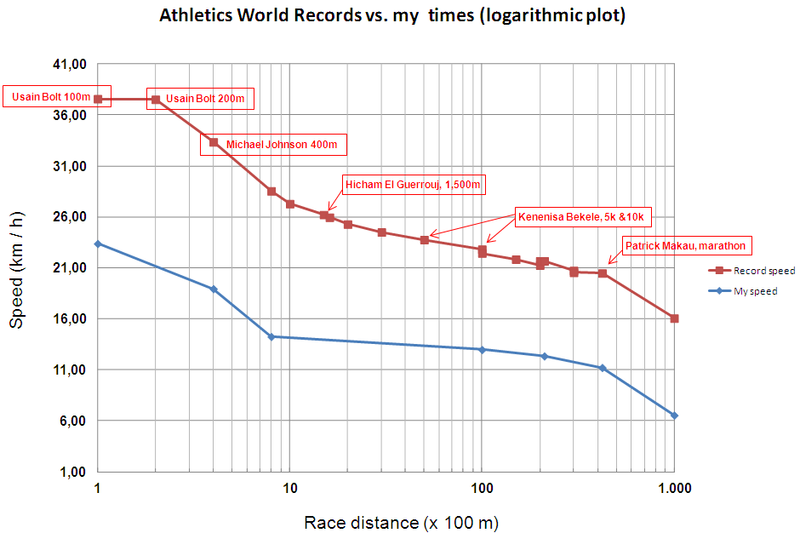 Athletics World Records vs. my times (speed) – logarithmic scale for the distances. 100m and 200m races are fully anaerobic where Usain Bolt is capable of maintaining an average speed of above 37.5 km/h. You can see in the explanation in the Wikipedia how these two races (both lasting below ~30 seconds) use as energy source high energy phosphates. races from 400m to 1 km are still a high intensity activity, with some anaerobic component, though another energy source enters into play: anaerobic glycolisis. And as we have heard often in descriptions about 400m races, the consequence of rapid glucose breakdown is the formation of lactic acid. from then (1.5 or 2km) on (up to 42km) professional runners are able to keep a high speed out of aerobic metabolism (using adenosine triphosphate, ATP). Of course, speed decreases with distance, but from the 26.2 km/h of a 1,500m to the 20.5 km/h of a marathon the speed decrease is of -22% for a race 28 times longer! for ultramarathons (over 42k) speed starts decreasing at a higher pace, though Wikipedia only offered the 100k time. Probably more data can be found in the web to try to find with more accuracy up to which distance the long distance stable pace could be maintained. Uwe, you were certainly right. This view offers another very interesting perspective to the game :-). Red lines show speed (in km/h; decreasing as race distances get longer). 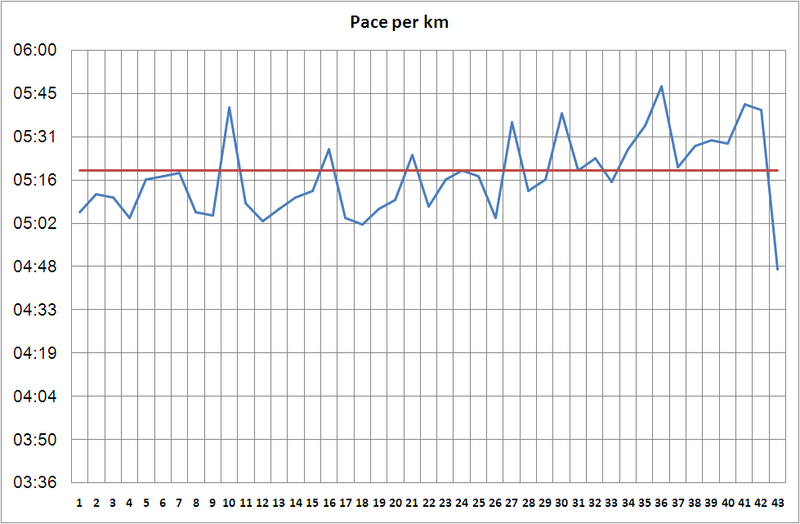 Blue lines show pace (in mm:ss / km; increasing as race distances get longer). I have included a table so you can compare the numbers. I took athletics world records from the Wikipedia. You can find my times in the page “Races” of this blog. I only added a tag to the records that most of you will recognise, as they were achieved by well-known super stars. I could have kept up the pace of Patrick Makau in his marathon world-record-beating performance for 100 metres… but not for 400m! (see black dotted lines). How once we enter into aerobic exercise, we’re able to almost keep up speed despite distance increases. The difference in speeds between Bekele’s 5k (23.77 km/h) and Makau’s marathon (20.48 km/h) is only 3.25 km/h! NOTE: I am not a particularly fast runner, thus don’t take the times and paces and interpret them as if no amateur runner could keep up pace for more than 100m… some will keep it up somewhat longer. I just wanted to share the idea. During 2000 and 2001 I ran 3 marathons in Madrid. The best time I achieved then was just slightly above 4 hours, 4:00:41. Then I didn’t train much for them and I paid for that during the races. 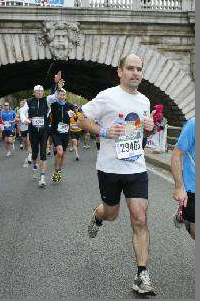 Last Sunday, in Paris, I ran together with my friend Serna and my brother Jaime my 5th marathon. For this one I had a training plan to go through for 17 weeks. That training plan amounted to over 1,100 km running, and a series session per week. I started a bit late with it, then I had trouble in the adapation to the new soles, injures… in the end, during the last 4 months I ran almost 500 km, or about 45% of the plan and did only 5 days of series. Even if I was under trained, I managed to recover from the injure about 2 months before the race. I run as much as I could during the weeks following the recovery: 330km in 7 weeks, including 4 consecutive Sundays with a run over 20km in each of them. 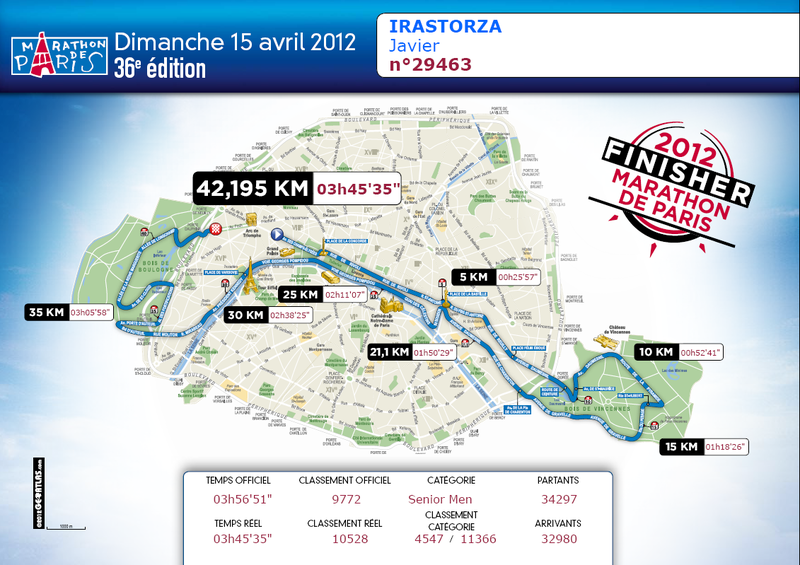 The result: I completed Paris marathon in 3h45’35”, just at my target time before starting. My first sub-4-hour marathon. You can’t imagine how happy I am for that. Some curiosities related to the race. You may find the route we followed in the diploma below. Some of the views while running were superb (Eiffel Tower, Place de la Concorde, Les Champs-Élysées, Place de la Bastille…), even if when running a marathon you don’t get to enjoy much the views. In the diploma you will see as well two times and positions. This is due to the fact that it took me 11 minutes to reach the starting line. Positions are calculated taking into consideration net times (deducting time to starting line, “real”) and arrival order (“official”). You can also see below a small graphic prepared from the info recorded by my Garmin. There you’ll see how until km. ~29, I managed to run below my target pace to achieve 3h45′ (that was 5’20” per km). There are some kilometers before km. 29 in which it took longer, that is due to stops (“WC”) or slowing down to take drinks at every 5km. From km. 30 it was hard to maintain paces even below 5’30”. In the last 12km I burnt the 2-minute buffer I built in the first 25km. In order to keep the rhythm in the last kilometres, it is extremely important not only the long runs (I got the one and only “muscle warning” at km. 39) and the series training, the famous Yasso’s to keep “speed” and endurance.